Interesting tales at both ends of the App Store this week. Angry Birds Space achieved 10 million downloads in three days, a story so important that literally every site on the internet reported it. At the other extreme, one-man developer Mr Qwak had his well-received iOS game Retro Racing removed from the App Store for what amounted to a banking error, then thankfully reinstated, albeit a few days later. His account of the removal and subsequent reinstatement is admirably balanced, and offers a fascinating insight into indie development. Anyway, onto a couple of games that don’t really need any more coverage, but I feel compelled to write about. I’m awful at rhythm-action games, and I know it. But every few years, a game too interesting to ignore comes along, convincing me to give the genre another try. Space Channel 5 was one. Loved the look and sound of the game; bloody awful at it. Hence misery. 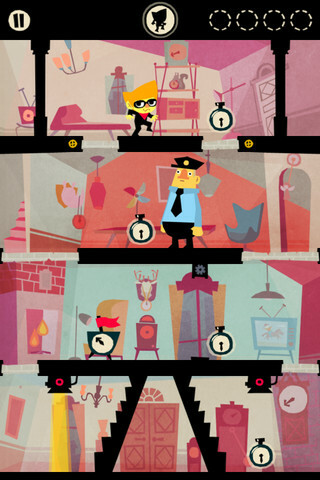 Beat Sneak Bandit is the latest: it’s achingly stylish, and the sneak-to-the-beat premise is inspired. It’s funny, and the levels are exquisitely designed. Yet I just can’t deal with it. It’s hard work for me: I can manage a couple of levels before my concentration falls, and I begin to fall out of time with the beat – through a combination of ineptitude and impatience – and get stuck there. It’s completely my fault. The game is outstanding, but I just can’t enjoy it like I want to. Highly frustrating. ZiGGURAT, on the other hand, has turned out to be something of a slow burner. It’s incredibly simple: you’re the last human alive, standing atop a ziggurat (look it up), armed with a laser rifle, fending off the advancing aliens for as long as possible. A couple of goes, and you’ll have the measure of it. Next. But there’s a strange appeal. Back I went. A few more goes. And actually, the aiming system – sliding your finger along the bottom of the screen to aim, holding it down longer to charge the shot to a maximum which is maintained just for a moment – is more precise than it perhaps first felt. Failure is my fault. Not wishing to invoke the name lightly, it’s starting to earn a long term place on my iPhone similar to Canabalt. It may not lend itself to prolonged play, but the simple mechanic, together with distinctive looks and sound, mean it’s always tempting when I’ve got a few minutes to fill. Jake has been here since the beginning, with hundreds of reviews and countless other guff to his name. These days, not so consistent.